Sometimes, characters from the Mario franchise will state or do something that implies that they are aware of being fictional characters in a video game; this is known as breaking the fourth wall. The reason it is called "fourth wall" is because the term originated from plays in theaters, when actors would look at the audience, talk to them, or do anything else that involved the audience. Because the stage would generally have a wall at the back and both sides, this concept involves the actors becoming involved with the audience who are at the front, which can be considered an invisible wall, making it the fourth one. Note: Video games frequently break the fourth wall in order to address the player with directions (i.e. "Press A to jump"). These instances are not to be recorded here, unless the characters are aware they are in a video game due to the remark. 1.2.1 Donkey Kong Country 3: Dixie Kong's Double Trouble! 1.4.2.1 WarioWare, Inc.: Mega Microgame$! 1.4.5 Wario Land: Shake It! 1.5.7.3 Mario vs. Donkey Kong: Minis March Again! 1.5.7.4 Mario vs. Donkey Kong: Mini-Land Mayhem! アリガトウ！, the message found in 9-4. In the final level of World 9, a group of tile blocks can be found spelling out "アリガトウ！" (Arigato!, meaning "Thank You" in Japanese). Also, the opening of World 9-1 features a message saying "WE PRESENT FANTASY WORLD. LET'S TRY '9' WORLD WITH ONE GAME. ", and the Game Over screen for World 9 has a message saying "YOU'RE A SUPER PLAYER! WE HOPE WE'LL SEE YOU AGAIN. MARIO & STAFF." YOU ARE A SUPER PLAYER!! The message at the end of Funky in Super Mario World. After the Yoshi Eggs hatch during the ending sequence, the words "THANK YOU" appear as Mario gives the V for victory sign to the player while Princess Toadstool (or Peach in the GBA remake) waves to the player. At the end of the remake, Super Mario World: Super Mario Advance 2, there is no text, though the princess still waves at the player and Mario and Luigi will still flash the peace sign. In the last level of the Special Zone, Funky, a group of coins spell out the phrase, "YOU ARE A SUPER PLAYER!!" near the end of the level (in the Japanese version, the coins spelled "YOU ARE SUPER PLAYER!!"). At the game's title's screen, Mario will speak to the player with lines such as "It's-a-me, Mario! Hello!" and "Press Start to play!". At the ending sequence, Mario (or Yoshi in the remake) points his face to the player. In the two versions, after Bowser is defeated in Bowser in the Sky, he will exclaim, "C'mon, troops! Let's watch the ending together! Gwa ha ha!" Additionally, if Mario retrieves all 120 Power Stars and then defeats Bowser, the Koopa King will say, "Just you wait until next time. Until then, keep that Control Stick smokin'! Bwaa ha ha!" In the case of Super Mario 64 DS, Bowser says the same thing after all 150 stars are collected, however he mentions the Touch Screen instead of the Control Stick, as the Nintendo DS does not feature a Control Stick. After the end credits in both versions, Mario is heard saying, "Thank you so much-a for-to playing my game!" He uses the same phrase in Super Mario Galaxy and its successor, Super Mario Galaxy 2, though he removes the "-a" from "much" and the "to" from "for". In the N64 version, after Mario collects all 120 stars, shoots to the top of the castle and talks to Yoshi, he gives Mario the following message: "Thanks for playing Super Mario 64! This is the end of the game, but not the end of the fun. We want you to keep on playing, so we have a little something for you. We hope you like it! Enjoy! --The Super Mario 64 Team" This is followed by Mario's lives counter going up to 100. In the case of Super Mario 64 DS, upon closing the Nintendo DS while playing , Mario says "Buh-bye!" to the player, after which the system goes into standby. When the system is opened, he says "It's-a-me, Mario!" This also happens in New Super Mario Bros.. When the player defeats King Bob-omb in Bob-omb Battlefield, King Bob-omb will say "Just select this star from the menu. For now, farewell." A Pianta ponders whether this is the end of the game. After Mario defeats Bowser and Bowser Jr., a certain yellow Pianta in Delfino Plaza will ponder whether the game is over and express his hopes of something else happening when Mario talks to him. In the intro, when Mario is hit by the green shell, the words "Super Mario Bros." fall from the sky. A few seconds later, Small Mario runs near it, notices it isn't straight, and jumps to hit the words and straighten them, also causing "New" to appear next to "Super". This only happens after waiting a few seconds on the title screen. After the end credits, the Touch Screen shows Bowser Jr. dragging his unconscious father back to their home. Bowser Jr. looks to the camera and threateningly growls at the player. He then resumes dragging Bowser. Similar to Super Mario 64 DS, Mario will also say "Buh-bye!" to the player when closing the Nintendo DS. He also says "It's-a me! Mario!" when the player opens the DS and resumes the game, similar to the opening title screen in Super Mario 64 and similar to that in its remake. The enemies and power-ups do a small dance when there is a little "bah bah" vocal in the music, such as Goombas jumping up in the air and Koopa Troopas will turn to the screen for a split second and rock their fists. This actually affects gameplay, as a Goomba jumping at the wrong moment could result in the player hitting a Goomba in the face rather than its head, or the player could fall short of a Koopa Troopa due to it stopping for a moment. Much like the ending to Super Mario 64, after the credits roll, Mario or Luigi will say "Thank you so much for playing my game" (Luigi, however, removes the "so much" part of the sentence). When 120 Power Stars are collected, after Mario or Luigi thanked the player, Rosalina will also thank the player and says "I will watch over you from beyond the stars." When Bowser's Airship takes off without Bowser Jr. aboard, he faces the player with a surprised look. He will also look surprised at the player if all the characters bubble or one of them bubbles and the other three take a Warp Pipe. Also, in the credits, the players play a minigame where they break blocks to earn coins. These blocks have the credits written on them. If less than four players are playing, the characters not controlled will dance to the music. The enemies still do a dance to the "bah bah" vocals in the music, along with the items and flowers bouncing and blooming to the beat. Also, when underwater, the Cheep Cheeps do a spin whenever there's a windchime in the music. If the player's Wii Remote batteries are low, and they talk to Lubba, he will warn the player about the batteries running out in a dangerous place. He will frequently make these kinds of references, such as suggesting that the player go to bed when it is late, or to turn off the game after a certain playing time, especially after getting a Game Over, or tell the player to take a break before playing again. Additionally, if the player plays the game at an early time, Lubba will say he is sleepy and that it is rather late to be adventuring. Sometimes, when the player gets extra lives while there are either two or three save files in the game, Mailtoad says "So this person you share a special bond... Could it be someone from another save file?". Before the battle with the Whomp King in Throwback Galaxy, he will say "Let's see you try and ground-pound the Whomp King again!" which means he is the same Whomp King that Mario fought in Super Mario 64. He will also try and say his opening lines he used in Super Mario 64, but before saying he is tired of this speech. If the player has 70 to 120 Power Stars, then at the end of the credits, Mario says "Thank you so much for playing my game", much like in the previous game and Super Mario 64 and Super Mario 64 DS. When playing as Luigi, he will say the same thing as its predecessor. If the player gets a Game Over or goes to a world for the first time, Lubba will speak to the player. When Mario/Luigi completes a level, they will face the player. When Mario finds Peach at Bowser's Castle, Bowser falls from the ceiling and punches the ground, cracking it. When the ground is about to break, Bowser faces the screen with a worried expression on his face. If the player continuously keeps on losing lives or plays for a long time, a notification tells the player to take a break. In Special 8-Crown, a group of Snake Panels near the end will be activated to spell out the phrase "THANK YOU!!" similar to other thanking messages in Super Mario Bros: The Lost Levels and Super Mario World. Roy's tail on the "D"
Near the end of the game intro, Ludwig von Koopa uses his magic wand to make the title and multiple coins fall from the sky. This only happens when watching the intro after a few seconds on the title screen. In the credits, Roy Koopa hangs off the D of EAD with his tail. After Bowser's battle in the Gold Classics Coin Rush pack, many coins form the sentence "THANK YOU!!" once again. The enemies still do a dance at the "bah bah" vocals. Early screenshot showing Mario staring at the screen. On the title screen, the characters ground pound to make the title and two Super Acorns appear. If the characters are idle, they stare at the screen. Baby Yoshis have an added choir to all the music that they mouth to. In the credits, the characters not being played dance to the music, and when a character being played runs near the credit letters, they spin around. The enemies still do a dance to the vocals. When the player starts up the game, Mario and his friends yell out "Super Mario 3D World!" The flowers and bushes move along to the music. The Green Sprixie Princess waves to the screen near the end of the credits scene. Upon completion of Bowser's Lava Lake Keep for the first time, once the transition occurs, shortly after, Bowser's laugh can be heard as he pulls back the transition to reveal that he has captured the Sprixies once more. At the end of Champion's Road is a series of Clear Pipes forming the message "THANK YOU!!" just before the Goal Pole area. In the E3 demo for Super Mario Odyssey, a NPC says, "We'll have to wait for the full game to go any further." The Mario 64 Cap and Outfit could possibly also be considered a fourth wall break as well, as it is a reference to the polygonal textures used in Super Mario 64, which the outfit originated from. Additionally, the Toad blocking the doorway to the Courtyard room in the Mushroom Kingdom states that he misses "Mario's blocky polygonal look", which in turn, refers to the block like textures used in said game. In a similar vein to the Mario 64 Cap and Outfit, the 8-Bit Mario Cap could possibly also be considered a fourth wall break as well, as it is a reference to the pixelated textures used in Super Mario Bros., which was the outfit's origin. In the Darker Side, a series of power lines that Mario must travel across by capturing a spark pylon spell out the message "THANK YOU" just before the Warp Pipe that leads Mario to the area containing the "Long Journey's End" Multi Moon. After the credits that appear after the player completes the main game, Mario says, "Thank you so much for playing my game!" Throughout the franchise, from Donkey Kong Country onward, whenever the player visits Cranky Kong he constantly remarks about how the games of yesteryear are superior to modern games, and often whines about how the game that he is in is too easy for someone like him to complete. The instruction booklets also contain even more remarks of this nature. Blunder breaks the fourth wall. If the Kongs manage to find Krematoa without speaking with Blunder, he will say "I can't believe you found the Lost World on your own! I bet you cheeky so and so's used Nintendo Power's guide! I know I did!" If the player hovers over the "Back" button on the main menu, Diddy Kong will arrive and wave goodbye to the player. In a secret area in Jungle Rhythm..., there is a Message Block that gives the message "We, the Mario team poured our hearts and souls into creating this game for your entertainment. It is full of secrets. Enjoy!" In the Game Boy Advance remake, the message is changed to "'How do you like this game? Goodies are hidden in every level, you know. You should look all over if you want to get 100 points! Investigate anything that looks suspicious." In addition, when Kamek shrinks Yoshi, Yoshi looks at the player with a traumatized expression. Same goes after he reverts to his normal size after Prince Froggy's battle. If the player gets a perfect score in every stage, a message comes up saying "Congratulations! What an amazing job! You are the _____st Yoshi to adventure on Yoshi's Island." The number to be shown here is the number of lives spent before the game's completion plus one (for example, if the player has lost 300 lives before completing the game, the message says that they are the 301st Yoshi). Each time the player eats a Heart Fruit after playing a level's minigame, a row of Coins forming a letter will appear. If the player puts all the letters from each level in order, it reveals the message "YOU ARE YOSHIS GREAT PARTNER!" Yellow Yoshi breaking the fourth wall. If Yellow Yoshi is hit by a hammer in Fort Bucket Booby Trap, he will be knocked into the screen and slide down it, resulting in the player losing a life. Also, after the credits, Bowser, who is behind the credits screen, smashes the screen if the game is completed if the Flutter Wings were used in at least one level. He then tells the player that they will be able to fight him after completing every level without using the Flutter Wings. In the Scrapbook Theater, if the player presses the A button on the Ukiki, it will scratch its head and look at the player after a few seconds. If the player is with Poochy, he will dance if the player collects a Wonder Wool or collects a Smiley Flower that Poochy brings to them. In the fifth short in the remake Poochy & Yoshi's Woolly World, "Chaaarge! ", Poochy looks and runs towards the viewer(s), Poochy then falls over when he hits the screen. Also in the short "What Goes Up... ? ", after Poochy looks up for a bit, he then looks at the viewer(s) and wags his tail. In the level Weighing Acorns, while waiting for the bus, Yoshi hums the level's background music. In the SNES version of Wario's Woods, after defeating the player in the VS. COM mode, Sven will tell Toad that he was "glad that [the player] didn't reset the game when he saw it was hopeless." Heads Up and High-Speed Chase quite literally breaking the fourth wall. In the microgame "Heads Up," if the player fails to catch the ball and it goes out of bounds, a hole will appear in the screen and the catcher will look at it. At the end of Mona's microgame category, she is looking at the customers while serving ice cream. The camera then irises out at her face, stops, and Mona winks at the player. In Orbulon's story, the Alien Bunny wasn't rubbing strong enough. Orbulon then told the player, "You out there, take over." 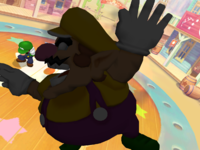 In the microgame "High-Speed Chase," if the player fails to run from the chasing object, Wario will be sent towards the screen, breaking it. Also, if the player blows on the GamePad, Ashley tries to cover her skirt as it goes up and will give the player an angry look. In the microgame "Parking Lot Problems", if a player fails to choose any car by the end of the microgame, the person will stop and angrily look towards the player. In the microgame "Heads Up," if the player misses the ball, a hole will appear on the screen and the catcher will look at it, just like what happens in the original version. In the microgame "Wet Your Whistle", the fourth wall is possibly broken after the player makes Wario drink up the liquid, as he looks towards the screen, giving the player a thumbs up, gaining muscles and turning into a vampire. In 5-Volt’s stage, if the player fails a microgame, she may ask, “Did your hand slip?” If the same thing occurs in Ashley and Red's stage, Ashley may say, "You must be cursed." Additionally, there are several other voice clips whether the player wins or loses a microgame, like Wario saying, "Aw, what you do?!" after the player loses three times in a row and Mona occasionally saying, "Aren't you clever?" when the player avoids a trick. During the Wario Deluxe stage, after the sequence where Wario Deluxe hides the control hints, he will say, "Getting too tough, kid? You can always give up!" After that, Lulu pops some balloons on his hot air balloon and jumps on him to grab the gold potty, after which she looks at the screen and says, "Hey! Hey you! I'll take care of Wario here. You go and win this thing!" In the minigame Wario's Homerun Derby, if the player hits a home run, the ball will be sent toward the screen, breaking it. In the manual, Wario complains about his transformations caused by enemies and blames the developers. In Wario World, Wario states "So admit it..... Don't I look cool in the game screens? Those long, muscular legs on my sturdy toned frame.... I'm the perfect specimen of a man ..... What!?!? You say I look fat and my quadruple chin looks like a waterfall of flab? Shut up! That's just because you have your television set up on widescreen display!" Whenever the player pauses the game, Wario will constantly sing, "Na Na Na Na Na, Na Na Na Na Na!" If the player listens for about 50 minutes, Wario will eventually say, "Sorry" and stop singing. If the Wii Remote is left idle, Wario may say, "Come on, pick it up and play." At the end of the game's intro, Wario's voice is heard quietly saying, "It should've been called Wario Golf. ...You're gonna love it!" 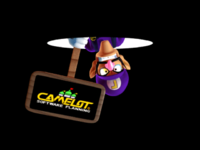 Waluigi, holding up the Camelot sign in the opening to Mario Golf: Toadstool Tour. Most celebrations have the characters facing the screen at the end of each hole. As an example, whenever Waluigi gets an Eagle or better, he will dance and spin all across the green until he points to the player, turning around upon realizing he is pointing the wrong way. Prior to the opening, Wario and Waluigi hold up signs for both Nintendo and Camelot respectively. This also occurs at the start of Mario Power Tennis. This is done in the same manner as in the previous game. For example, if Bowser gets an Eagle or better, he will run to the screen and breathe fire, or punch the screen if he gets a Bogey or worse. This is also likely due because of a Lakitu holding a camera, but he is not seen anywhere. Toadette breaks the fourth wall when getting the Eagle or Birdie, she gives the player a wink (although Lakitu is clearly holding the camera). Princess Peach also breaks the fourth wall when holding the flower, she also gives the player a wink during her Eagle animation. In his singles celebration, after eating Luigi, Yoshi looks at the player and shrugs. Donkey Kong also looks at the player and scratches his head in his singles celebration after grabbing his trophy from Toad, causing him to pass out. If the player completes Story Mode with all S's, the Millennium Star will tell the player, "You're spectacular. Truly spectacular. I imagine the development staff of Mario Party 3 is pleased as well. Keep up the good work." On the character select screen, each character will say "Good choice!" when chosen (except Yoshi and Donkey Kong). They say this again in Mario Party 4. The fourth wall's effect in the minigame Head Waiter. When the Bowser-shaped bomb explodes in Head Waiter, the person holding it will fly into the screen, tilting it. Peach and Toad will say "Good choice!" when selected. Also Wario will say "You'll get, Wario!" when selected. After a round of Bowser Land, Bowser looks at the player, saying, "That was fun! Come again soon!". When starting the game, MC Ballyhoo flies up into the air toward the camera, telling the player, "Welcome to the Star Carnival!" After MC Ballyhoo is concerned with Bowser having stolen the Star Rod, he says, "But wait! We have YOU! ", referring to the player. On the Star Carnival Stage, there are two screens which shows an 8-bit sprite of the words "MARIO PARTY 8." On the main menu, Yellow Toad speaks to the player. When Toad or Wario are chosen on the character selection screen, Wario might say "Good choice!" and Toad might say "Great choice!" When the players land on a Bowser Space, Bowser roars, and it breaks the screen. This does not happen on Bowser Station. In some of the Superstar celebrations, the characters will do something that makes them face the screen. An example is at the end of Magikoopa's, when he points his wand to the screen. When a character releases Bowser with all of the numbers on the Dice Block, Bowser appears by slashing through the screen with his claws (except for Chaos Castle). This also applies to the end of the Bowser Battle minigames during Bowser Party and amiibo Party as well as the North American commercial showing the gameplay for Bowser Party. Wario and Donkey Kong hitting the screen in Bowser's Fence Fury. In Bowser's Fence Fury, players who get knocked by Bowser hit and crack the screen. During the minigame Rolls for Moles, if the player scores a Perfect in the minigame, the last Monty Mole hit by the ball will bump into the top screen and slide down it. After the credits, Mario will say; "Hey, you're very good! See you next time!" The ending screen of Mario Kart 7, with all of the characters. After the credits, Mario shouts "Thanks for playing! Way to go!" or "Thanks for playing! You're the best! Ha ha!" depending on how much the player has progressed during the game, and the default characters or all of the characters wave to the player, including his or her own Mii. Mario yells out "Mario Kart 8!" when the game starts; additionally, Mario has the chance to say "Start your engines!". After playing the Mario Kart 8 demo, Mario will also say "Hey! Thanks for playing!" In Toad's Turnpike, trucks with Mario Kart 8 on the back and sides can be seen. While in Mario Kart TV, the player can tap on the Miis to elicit an annoyed response from them. Additionally, some tracks feature posters of the Mario Kart 8 cover. If Goombario uses Tattle on a Goomba, the tattle mentions that they have been around since Super Mario Bros.. While Mario is fighting Bowser?? ?, the Koopa Bros. try to lower his confidence by telling him that the phony Bowser is invincible. One of the things they say is "The sequel should be called Paper Bowser!" When Mario wins a battle, sometimes he looks at the player and give them a thumbs up. This also happens in future installments, except Super Paper Mario. At the beginning of the fourth fight against Jr. Troopa, he actually notices his HP bar when it has dropped to half, and comments that he lost his HP due to swimming across the ocean. At the end of the game, a Bumpty mentions that Herringway plans to write about Mario's story, coming up with the title "Paper Mario". Lord Crump (disguised) referring to the person "in front of the TV"
If Mario gets in Danger while fighting Gus, he will break the fourth wall by acknowledging that "…it'll be Game Over for you!" and that the player can choose their Tactics menu. After Mario defeats Gus, he will shout, "CRUD! You dumb video-game heroes always do this!" A young Toad in the Petal Meadows village will say: "There's this one game that just absolutely rules. It's called 'Fire Emblem'...". This reference was written shortly before the international release of Fire Emblem: Rekka no Ken, the first game in the series to be released outside Japan and seventh installment overall. Paper Mario and Fire Emblem are both developed by Intelligent Systems. In the Japanese version of the game, the Toad kid mentions Super Mario Bros. for the Famicom instead. After rescuing Koopley from Hooktail, Koops says: "For ten long years we all thought you'd...you know! We thought your game was over!" While describing how the Happy Lucky Lottery works, Lucky will explain that the daily number changes every day in real-time and that he uses the Nintendo GameCube's clock as a reference. If the player sets the GameCube's date back in an attempt to cheat the system, Lucky will penalize them. When Goombella tattles on Stewart in Glitzville, she will tell Mario that Cheep Cheeps have been a part of the Mario franchise for a while. In fact, Goombella even says, "Oh, gosh. I just broke through the fourth wall there, didn't I? Sorry. Just forget it." The same occurs when she tattles on the gatekeeper of Twilight Town, in which she says that the game would be too easy without him. Rather than directly referring to breaking the fourth wall, she only says, "Hee hee... Let's never speak of it again." Koops breaks the fourth wall after the fight with Doopliss where he says "Sort of easy for a boss battle as it were." Unlike Goombella though, he does not seem to notice that he broke the fourth wall. Doopliss also breaks the fourth wall during the chapter by removing the lowercase p from the naming screen. Just before Mario begins Chapter 5, Professor Frankly is about to tell them very important and long information concerning the Thousand-Year Door. He asks if they're ready to hear it, and then says, "And you there! In front of the TV! You listen up, too!". Mario's current partner out will question Professor Frankly (for example, Mini-Yoshi says to him, "Did someone pile-drive your head, or what? I don't see any TV here, nutjob!". Vivian remarks, "What to say... ARE YOU TALKING TO NO ONE?!?" Goombella even says, "Yeesh. First me, then you! Why do we always have to break through the fourth wall?") Frankly yells at them, saying to disregard it as he continues. Later during the chapter, Lord Crump (under his alias, "Four Eyes") tells the player that they'd better not tell Mario who he really is, though it is impossible to even use Mario to attack him until the end of the chapter. After Chapter 6, when Bowser makes it to Rawk Hawk's secret training facility, Rawk Hawk appears. As soon as he appears, he points at the camera insultingly asking the player if they forgot him. A Toad in Petalburg consistently breaks the fourth wall throughout the game. He states that he is a fan of Luigi and says he wants a game called "Paper Luigi". Later, he mentions that he is actually playing the game Paper Mario: The Thousand-Year Door and ends up beating it before the player does. In every chapter, he always talks about a different Nintendo game. In the Palace of Shadow, if Mario allows the Dry Bones to force him to the center of the room, Mario's partner will warn him that the floor will swallow them up. If Mario does not move to prevent this, his partner will scream that they are doomed. If Mini-Yoshi is Mario's partner at the time, he will say, "Awww, game over, man! WHOOOOOOOOOOOAAAAAAA!" After completing Chapter 6, a young Toad will appear in Cabin 007 of Excess Express. Should the player talk to him, he will ask Mario a quiz: "What did Bowser nab in the last Paper Mario?" The options are "The Star Cookie", "The Star Rod", and "Someone's Lunch". In Chapter 3, Hamma Jamma says that 7-1 was his grandfather's 'hood'. Several characters, the first one being Bestovius, refer to a certain button when explaining how to perform an action. When Mario asks what they mean by pressing that certain button, the character assures them not to worry, and that the great being that watches them (the player) will know what it means. For example, when encountered, Thoreau says: "What's this , you say? You need not worry. The great being that watches us will know what it is." However, during Garson's story "Stylish Moves," he states that Mario can perform one by shaking the Wii Remote; when Mario asks what the remote is, Garson replies, "What? What's a ? ...Don't worry. As long as the player gets it, we're fine," outright stating the existence of the player instead of alluding to them. Before fighting him in Chapter 3-1, Bowser shouts to Mario, "No more sequels!" and that he will finish him off, describing himself as "Grade A, 100% prime-cut final boss." Later, during Chapter 3-4, the last option for Princess Peach to choose on the Swoon.exe will result in her to outburst in anger and demand to know who is picking these answers for her. The Sammer Guy Mystical Whistle claims that no one can beat him without using hacks, a reference to players who use cheat codes and devices to make games easier. Another Sammer Guy named Invisible Brock claims that no one could find him without using a game guide. The Underwhere itself is a break in the fourth wall, because its inhabitants say that their game had ended. As with the rest of the series, death is referred to as getting a game over. If the player refuses to hear the Battle Spinner tutorial four times, Kersti will say "You know what? Forget you! Here--pick one of these answers so we can move on." The resulting answers will be "yes" and "yeah", forcing the player to do the tutorial anyway. Sombrero Guys, the Accordion Guy, and the Maraca Guy will play their instruments to the music when Mario gets close to them. When the player saves Traveling Toad in Drybake Desert, he admits he wants to leave because there is "this weird music that never stops". This is probably referencing to the background music, and the added instruments from the Sombrero Guy, the Accordion Guy, and the Maraca Guy near him. Also, when the player fights Gooper Blooper, his tentacles clap along with the music. When Mario uses a Slaphammer sticker and manages to do an "Excellent" move, the enemy will be flung in the air, and crash into the screen. When Mario stays still, the HP bar shows up and if one were to blow in the microphone, it would sway from the left to right. When the player moves their 3DS, Shiny, Flashy, Big Shiny, and Megaflash stickers will shimmer. If Mario runs away from the fight with Bowser Jr. during Bowser Jr.'s Flotilla, he will proclaim himself final boss. Huey told Mario about the Game Over screen if he falls off. When the Fan Thing Card is used, all of the enemies will fly to the screen before falling. Before Mario falls off the Kiwano Temple, Huey saves him and said that he would've seen the Game Over screen if it wasn't for him. When Mario fights a Blue Slurp Snifit in battle, one of the things it will say is "This is not a game! ", due to the game itself having goofy humor. In Snifit or Whiffit at the Cobalt Base, the Snifit warns Mario that making a mistake in the Bonus Round gives him an instant Game Over and the save file will disappear forever. Shortly after he says this, he says he is just kidding about the disappearing save file, but is serious about the instant Game Over in the Bonus Round. Underneath the Mustard Café, a yellow Snifit throws Mario in jail and threatens him not to escape before realizing that they cannot do anything other than throwing him in jail without changing the age rating of the game. When Mario repaints a green Toad at the beginning of Mossrock Theater, the Toad will say that the forest is creepy. He will then say, "I mean, just listen to this music! ", referring to the music in the level. After the green Big Paint Star is collected and the final memory is seen, Huey says that the game's events would not have happened if a no mixing colors sign was put next to the Prisma Fountain. When the player beats the game, the Toad with the newspaper in Port Prisma says "Prisma Fountain Restored! Game Beaten! Not sure what "game beaten" means, but would you like to watch the Prisma Splash parade again?" Bowser breaking the screen at the end of the game. When Bowser's Castle plunges into the ocean, Bowser hits the screen, cracking it. In Mushroom Plaza, when Mario talks to the Toad by the fountain he will ask Mario if he wants to hear about Action Commands. If Mario says no every time, the Toad will say "Action Commands are... Well go read the instruction booklet!" After beating the game and after the cake picture, Chakron will directly compliment the player. The last one of Bowser's ranks is Final Boss, referencing that Bowser is the final boss in most Mario games. If the player talks to Toadbert after beating Junker, he will mention a dream where he hears the " " buttons being pressed. Inputting this code will speed up the scene in the Lumbar Nook. After freeing Brickle in Mushrise Park by increasing the water pressure on the fountain that he is stuck in, the top part of the fountain will launch into the air, break a hole in the screen and get stuck in it before shattering the screen completely and falling onto Grobot, which results in him malfunctioning. Pi'illoper also breaks the fourth wall in-universe in his chronicles of the Pi'illos, by directly talking to Mario and Luigi. If Mario and Luigi drink from the fountain on Mount Pajamaja, they will go into a dream, and "Game Over" will appear on the screen during the dream. Shortly after, Prince Dreambert wakes them up. Getting hit by one of Mount Pajamaja's attacks will knock Mario into the 3D screen, rendering Bros. Attacks unusable in the process. Paper Mario giving a thumbs up. After Nabbit has stolen Bros. Attacks, Toad laments that, if Bros. Attacks were lost, it is over for not only for Toad himself, but also for Mario and Luigi, for Mushroom Kingdom, and the game itself. He then says that it is going to be Game Over for "for all of us". Before the Paper Petey Piranha boss fight, the Toad that Petey grabbed will tell the player "I'm as anxious as you are to move on, but please don't press to fast forward!" The Toad then launches into a very long explanation of why Petey Piranha is here when they already defeated him while an onscreen prompt appears saying "You can fast-forward with ". 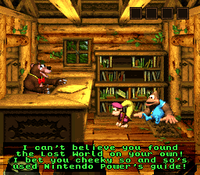 At one point, Starlow breaks the fourth wall by looking at the player and saying "Now, back to the adventure!" (referencing Stuffwell's catchphrase from Partners in Time). When Luigi is separated from Mario and Paper Mario, Starlow references the Year of Luigi to cheer Luigi up, and saying "It's basically Luigi RPG now!". While the trio climbs the Paper Toad staircase to Neo Bowser Castle, along with compliments like, "You can do it!"' or tips like "Eat a healthy breakfast!" (which is a minor fourth wall break), another Paper Toad says "Make sure you save your game frequently". Just like in the previous installment, the game tells the player to take a break if he/she goes to the menu after playing for a long period of time. When Paper Mario gets an "Excellent!" on a Jump attack, he will give a thumbs up to the player. Bowser hitting the screen after being sent flying from the castle's explosion. When Bowser's Castle explodes at the end of the main story, Bowser hits the screen, cracking it, just like in the original. The same thing happens at the end of Believe in Bowser in Minion Quest: The Search for Bowser, but with Captain Goomba, Captain Koopa Troopa, Captain Boo, and Captain Shy Guy. At the end of Credits 1 and Credits 2, Mario will say "Thanks very much for-to playing my game! ", a line similar to the one at the end of Super Mario 64. Also, Mario makes several remarks at the credits in Credits 2 as they pop up (such as "Oh, the engineering! Mamamia!" and "Ooh, don't forget to thank Mr. Miyamoto."). Also, Mario breaks the fourth wall in every level (bar the Mini-Mario and boss levels) by smashing the Crystal Ball against the screen to break it. When the player closes/opens the Nintendo DS or Nintendo 3DS, Mario can be heard talking, sometimes to the player such as "What's up?". Also, in the final cutscene, Mario, Donkey Kong, Pauline and the Toads are seen waving at the player. When closing the Nintendo DSi or Nintendo 3DS, Mario will say "I love this game!" and "Hey! You! Come back-a here!" Opening the system again will result in him saying things such as "Let's play again!" When closing the Nintendo DS or Nintendo 3DS, Mario will say the same things he did in the previous game, along with some new ones, including "Ow, my head!" and "Whatta' you doing?" Mario and Little Mac, having been screen KO'd. When a character is KO'd by being sent off the top blast line, they may occasionally hit the screen before falling and losing one of their stocks. This is called a screen KO. Just like in his original games, one of Sonic's idle animations has him looking at the player tapping his foot impatiently. His other animation has him turning to the camera and waving his finger in a patronizing manner. When Mr. Resetti is released from an Assist Trophy, he may tell the players to stop resetting, as he considers it to be a form of cheating in the Animal Crossing games. Additionally, if the game is being played late at night, he may tell the player to "get some shut-eye". When using Solid Snake's codec on Sonic the Hedgehog on Shadow Moses Island, Otacon says that people are excited that he is in Super Smash Bros. Brawl. In the codec on Mario, Colonel Roy Campbell says that Mario made his first appearance in 1981, and in Jigglypuff's codec, he says that it takes all kinds of energy in Super Smash Bros. Brawl; Colonel also mentions the WarioWare games in Wario's codec. In Pit's codec, Otacon says that Pit has gone through "countless trials over the years", to which Snake replies, "And by 'trials', you mean 'Game Overs'?" Finally, when Snake uses his codec on Mr. Game & Watch, Otacon will talk about his first appearance, 1980, and his console, Game & Watch. There are other Codec Conversations that break the fourth wall as well. There is a scene in The Subspace Emissary mode where Snake reveals himself after being hidden in his cardboard box for a long time. While facing towards the screen, he says "Kept you waiting, huh?" There are no other characters in his vicinity during the scene, so he must have been talking to the player - in reference to the fact that a brief scene of him hidden in the cardboard box was shown much earlier in the Subspace Emissary storyline. This is the only time the characters say a full sentence, excluding Pokémon. In a similar manner, before facing Wolf O'Donnell in The Subspace Emissary, Wolf will appear to look at the screen, and strikes a pose at the challenger. Since Wolf does not interact with anyone directly, this is likely a sign of breaking the fourth wall. During gameplay, super heavy characters, such as Bowser, will shake the screen when they hit the ground after jumping, due to their high weight. Bowser Jr.'s Final Smash, Shadow Mario Paint, involves painting a giant "X" across the screen itself. In Duck Hunt's reveal trailer, the dog and the duck actually dodge their introduction statement. In the Palutena's Guidance conversation for Link, Pit mentions how both of them were "born around the same time". Palutena also mentions Pac-Man's creation date during his conversation. Similarly to the previous game, Bowser's footsteps cause the screen to shake. Luigi breaking the Fourth Wall. Melody Pianissima plays songs from the earlier Mario games and asks Luigi what game it appeared in. (Super Mario Bros. 3, Super Mario World, etc.). She will also play the Luigi's Mansion theme while Luigi is in the hallway next to the vase with the picture above it. Luigi occasionally hums and whistles the theme as well. Whenever Luigi gets a key/valuable item, he shows it to the player. An earlier version of the game shows Luigi looking at the player in the Foyer. Luigi hums the background music to the various mansions when the player does not touch the controls for five seconds. During the intro sequence, Bowser will tell the player to shut the door, using the Nintendo DS stylus, so that he and his minions could continue discussing their plan. During the ending sequence, the player is asked, "So, how did YOU feel about this last adventure?" The player is also told that the Vibe Scepter might be in their house somewhere. Sometimes, the team captains will look at the screen, making it seem that they're looking at the player. One example is during one of Waluigi's losing animations where he looks at the screen and then prepares to punch it. During Wario's home entrance, he will hum to his own theme. After Mario and Mallow join Geno while he is fighting Bowyer, Bowyer will retort that a three-on-one fight isn't fair. To compensate for this, the Y, X, and A buttons of the SNES controller will appear in front of him. Bowyer will then fire an Aero at one of the buttons, which will effectively lock the ability to use that button's commands (magic, items, or attacks). Only one button can ever be locked at once, although Bowyer will continually fire Aeroes at the buttons every few turns until he is defeated. Upon defeating Culex, he mentions that "Perhaps in another time, another game, [he and Mario] may have been mortal enemies...", which also references how Culex parodies bosses from the Final Fantasy franchise. During the ending sequence, there is a scene where Mario, Princess Toadstool, Yoshi, Toad, and the Chancellor wave at the player, with the words "THANK YOU" displayed at the top of the screen. The scene ends as the camera irises out on Mario, who then winks at the player. After the credits, when Captain Toad chases either a Green Star in the Wii U version or the Odyssey in the Nintendo Switch version, Toadette, after attempting to call Captain Toad back a few times to no success, looks at the screen and says, "Oh, no!" Bowser's Fire Breath on the screen in one of his golf post-hole animations. During golf, characters will perform their post-hole animations on the player just like in Mario Golf: World Tour. During the intro of the game, after Mario points out how Luigi points to the screen and says "And you gotta help us!". In turn, Mario says "If you need instructions on how to get through the Hotels check out the enclosed instruction book." Throughout the many other cut scenes of the game, Mario and Luigi will continue to speak with the player. These lines include Luigi saying "Looks can be deceiving when Koopas are involved" whilst facing the screen, and Mario saying "Remind me to check", "You know what they say, all toasters toast toast", and "When you pinch Wendy's Pennies, they pinch back" whilst facing the screen. Also, at the end of the game, the Mario Bros. and Princess Toadstool wave to the player and congratulate them for the completion of the game, and Toadstool even thanks the player individually for helping her. Before many of the games listed above came out, the Fourth Wall was broken in several of the cartoon episodes. Throughout the three DIC Entertainment cartoons, commercial bumpers for the shows were announced to the audience by various characters at the start and end of the commercial breaks (i.e. "Be right back, paesanos! ", "And now back to The Super Mario Bros. Super Show!"). These commercial bumpers can be viewed on the DVD sets of The Super Mario Bros. Super Show!, but were not included on The Adventures of Super Mario Bros. 3 DVD set. Additionally, the first three weeks of episodes for The Super Mario Bros. Super Show all contained unique bumpers featuring scenes and voice overs related to the episode's live-action segment. All of the later episodes used a few generic bumpers that were announced by Mario, and showcased a still shot from the opening sequence. When The Adventures of Super Mario Bros. 3 aired on NBC during its original run, a character from each of the two upcoming episodes, as well as a character from Captain N: The Game Master, which aired between the two episodes, would all narrate a preview of the upcoming episodes before the show started. This trend continued with Super Mario World. These previews were not included on the DVDs due to the fact that they are considered the property of NBC. At the start of the opening sequence, Mario shouts out to the audience "Hey, paisanos! It's The Super Mario Bros. Super Show!". In the live-action segments that aired from Monday through Thursday, Mario, Luigi, and/or the guest star will tell the audience to watch a preview of Friday's The Legend of Zelda episode. At the end of every episode, Mario, Luigi, and sometimes the guest star will say to the audience "Til next time, everyone... Do the Mario!" After Blackbeard Koopa kidnaps Princess Toadstool, he asks "Would Blackbeard Koopa lie?" and winks to the viewers. After Mario, Luigi, Toad, and Princess Toadstool successfully enter the Koopa Klub, Mouser turn to the audience and says "Oy! Some people are really shtupid!". Near the start of the segment, Luigi tells Mario to get the door for no apparent reason. At that moment, the doorbell rings and Mario goes to answer it. After taking a few steps, Mario turns to the viewers and utters "How does he always know?". At the end of the segment, Howard Stevens bids farewell to the audience as if he were hosting a television program. Mario and Luigi then gaze at the camera with startled faces, prompting Luigi to ask Howard whom he was talking to. At the end of the episode, Mario, upon hearing the mention of dinner, comes running up to Pronto and an old man at a very high speed. After making his entrance, Mario then says to the viewers "And you thought Pronto was fast!". After Luigi correctly guesses that Mario had been speaking to Tommy Lasagna on the phone, Mario turns to the viewers and gripes "But how does he always know? ", much like he did previously in "Defective Gadgetry". The term "Real World" can be considered breaking the fourth wall, as it implies the characters know they are in a make-believe world. When Mario says to Toad to bring back the Pile Driver Micro-Goombas, Toad winks to the audience. When Princess Toadstool was talking to Bowser about the election to be Mushroom Kingdom's ruler, Cheatsy Koopa looks at the watcher and says "That's King Dad? (laughs) Are you kidding?". After he say this, King Koopa says "What are you laughing at?" because he does not understand that Cheatsy was laughing at the audience. When Mario and the gang see the large fire pit they must cross, Luigi takes note of the Dark Land music in the background and nervously shouts "Stop the music! ", to which the music stops. Luigi tells Mario that they cannot cross that pit, but Toad sees some ? Blocks that can help them. Mario calls out for the music to start up, and new, more epic background music plays. Later on in the episode, when Princess Toadstool and Toad are flying with P-Wings, Princess Toadstool says to Toad when he complains about his appearance "It's not like you're on television with millions of people watching you!". At the end of the episode, the Statue of Liberty comes to life to tell the audience "Those Mario Bros. are super!" At the end of the episode, Luigi asks if people in the Real World will ever accept others regardless of their color, to which Mario, while facing the camera, responds "Yeah, when humans get as smart as Mushrooms." At the end of the episode, Mario turns to the audience and says "Brothers, you can't live with them... you can't live without them." and smiles. At the end of the episode, the Koopa Troopa blinks to the audience. When Bowser is luring the cavepeople of Dome City to his Koopaling Bros. Circus, he says to the audience "This is easier than talking Kootie Pie into a shopping spree!". When Oogtar exclaims "Merry Cave Christmas, Mario-dude! ", Mario tells the audience, "Don't you wish every day were Christmas?" Mario might either be talking to the audience or Oogtar. When the cave-people buy fast food from Scoopa Koopa's Fast Food, Bowser turns to the camera after watching the cave-people buying food and says "...it makes me filthy rich at the same time! (laughs) Wait 'til you see the side effects! (laughs) Those bird-brains don't even know what hit 'em! (laughs)". Also, when Mario refers to Bowser's bill as highway robbery, Bowser responds by saying "Well I call it inflation..." before turning to the audience and continuing with "...in more ways than one! Wait 'til the calories start piling up in his waistline!". When Cheatsy is spying on Mario and Yoshi, he stops to tell the audience "I am the Emperor of Eavesdropping! ", then goes back to spying. Cranky breaks the fourth wall at the beginning of the episode to introduce the Crystal Coconut, Donkey Kong, and King K. Rool to the viewers. He later breaks the fourth wall again at Bluster Barrelworks to explain the purpose of the factory and introduce Bluster Kong. Bluster Kong claims that after he finds the treasure, he will be "an even richer richest ape on Kongo Bongo Island." He then looks and points at the camera and says "And that's rich." Shortly after Donkey Kong loses his memory, Diddy rushes off to find Cranky, telling DK that he has got problems. DK responds by looking at the camera and saying "I'd say he's the one with the problems." When Bluster steals the Crystal Coconut, he whispers to the audience at the start of the music. During the songs "I'm Gonna Be a Star" and "Be a Bad Guy", the characters look, point or even refer to the viewer many times. At the end of the episode, Donkey Kong blinks to the screen. During the song The Coconut is Cursed, King K. Rool, Klump and Krusha sneeze on the camera. Soon after, Donkey Kong cleans it with a scarf. Super Mario-Kun frequently breaks the fourth wall usually by heads-up display placement. For instance, in story arcs related to Super Mario 64, Mario's health displays often, at low health. In several instances during the arc based on Mario & Luigi: Bowser's Inside Story, the Nintendo DS Lite occasionally illustrates two simultaneous events, mimicking the game. A recurring theme within Super Mario-Kun is the preview for the future volume; a character partially "rolls" the page in the future volume, covering some of it. Some dialogue within the Super Mario-Kun also breaks the fourth wall when trying to explain the plot. In one instance, when Mario questions Stuffwell why a someone is holding a Cobalt Star shard, Stuffwell dismisses it by saying that it happens regularly in the games. ↑ Legit Translation… or Clever Fire Emblem Advertisement? This page was last edited on April 15, 2019, at 20:30.